In an attempt to influence public opinion, the leaders of both major parties — Democrats and Republicans alike — craft talking points, scripts for rank-and-file members to follow when discussing particular policy issues. 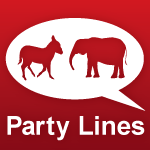 Talking points, when used frequently, become the party line. On this page, we feature some of the misleading talking points used by both parties. For years, President Obama promised millions of Americans with health insurance that “if you like your health care plan, you can keep your health care plan” under his health care overhaul. He wasn’t the only one, either. A number of Republicans are using misleading numbers when they say the Federal Aviation Administration should cut consultants and travel before resorting to furloughs that are causing airport delays. Republicans claim the federal government will “collect more revenue in 2013 than ever before.” But that’s only true in raw dollars, not as a percentage of gross domestic product, which accounts for growth in population, inflation and earnings.